Obviously, one bite at a time... and invite absolutely everyone you know. Our trip is over. As with any great life passage, we punctuated our journey with a big party at the beginning and end: opening and closing ceremonies at the Olympics, baby shower and wake, bridal shower and girls' recovery night out, bon voyage and fin du voyage. 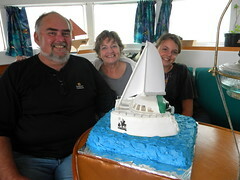 Our Bon Voyage party was in May 2008. We invited our neighbors, our friends, our family. It was a stunningly beautiful day as only Seattle can be when the weather is perfect. In fact, the mountain was out... a statement meaningful to anyone who has lived in the Puget Sound for any length of time. We were happy and scared, excited and absolutely ready to embark on completely new lives. Our Fin du Voyage is a bit diferent. We are bringing to a close an amazing phase of our lives. We aren't quite moving forward into something utterly new and strange. Yet, we aren't really doing anything we've ever done before. Living aboard a boat, going to public schools, working... it's been a long time. Morever, when we did these things last, we were very different people with utterly different priorities. It's possible that our emotional roller coaster could be described using almost the same adjective: happy, scared, excited, ready for a new way of life. We broke our Fin du Voyage party into several separate gatherings. If we've learned anything over the intervening years, it is that there are a finite number of people you can host on Don Quixote at any given time. A few too many and she starts to sink. Her waterline way back when with all those people on her was a bit terrifying in retrospect. So we broke the party into bits hoping that the fickle weather gods of this Lousy Summer from Hell would cut us a break and at least one of our parties would be pleasant. Give those fickle gods credit for consistency. The weather sucked each and every time. As a rule, the weather was perfect either the day before or the day after each gathering. On the day of the BBQ, cruise, or gathering, however, it was either a) super windy, b) overcast and drizzly, c) colder than Idaho caves, or d) all of the above. As a result, we had a far fewer guests joining us during our Fin du Voyage do's than we had hoped. It's also fair to say that we just don't know all that many people yet. We know a few amazingly cool people, mind you, but it's not like we spent our first year in New Zealand becoming the social life of the Auckland party. 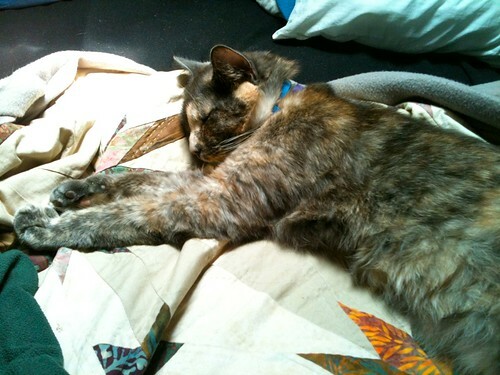 DrC and I are not all that good about getting out of the house as it is. Give us the mistaken notion that we're only going to be in New Zealand for "a few months", and we basically failed to extend our reach beyond a very tight, close circle in Pukekohe. It is probably time to change that approach, however. First, Pukekohe is 30km and 45 minutes south of here. We can't simply pop over for a glass of wine of an evening when we are in the mood. So as a start, we are making a concious effort to reach out to our marina neighbors. The summer (that really an inappropriate word for it but for lack of a better one...) is winding down. The fair weather sailors and the owners of stunning dock jewelry are gradually abandoning the liveaboards for the duration. The nights are chilly, the parking lots emptying out, and our sense of the marina as belonging only to the live aboards increases weekly. Time to dig in for the winter. 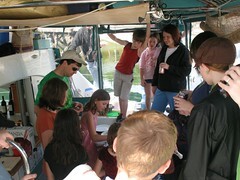 To kick off this spirit of neighborliness, I've been pushing for bi-weekly liveaboard dinners. I have read countless accounts of liveaboards who talk about their marinas as the best neighborhood possible. 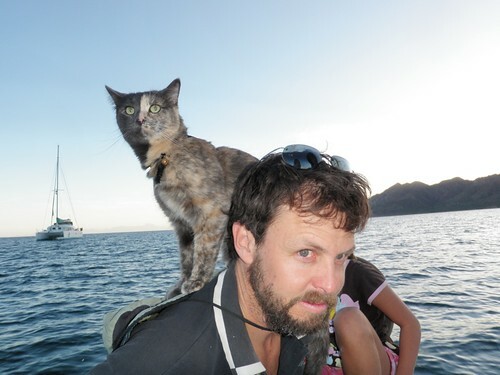 Liveaboards in good marinas take care of one another. They take care of the boats around them. So, we kicked off dinner this month at the lounge with a feast of boat cake. 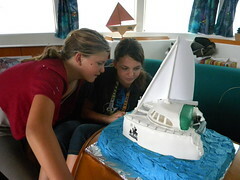 The boat cake was the best idea ever. The genesis -- as with so many good things -- was over a glass or two or three of wine while we visited with a friend before leaving for Mexico. Peter's vocation is computer geekery. His avocation, however, is cake making. He crafts the most amazing cakes. We thumbed through pictures of his many creations ooo'ing and ahh'ing. Somewhere it just popped out, "You should make US a cake! When we get back!" "What do you want?" asks Peter. "I don't know... the sea, the Toast Floats logo, our navigation path..." my voice trails off. Aeron pipes up, "Don Quixote! You should make Don Quixote." I think DrC and I laughed. Whoever heard of a cake boat. 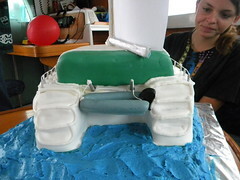 Or a boat cake. Far too fancy. Far too much time and trouble. Never mind. The Don Quixote cake was stunning. My favorite bit was the dinghy on the davits at the back complete with a wee outboard motor. I think I'll just throw a bunch of pictures on this post and call it done. The cake really speaks for itself.